Comcast keeps on claiming that mobile broadband is real competition for wired home broadband. But for most users, it’s just plain not. Not only is the speed and reliability of mobile broadband still hugely variable depending on location and time of day, but also mobile data is still clearly not competitive on price. And just how much more expensive is it to keep your phone on 4G instead of grabbing the nearest wi-fi signal? Our math says that trying to use your mobile data the same way you use your home wi-fi will cost you about twenty times more per month than your wired broadband bill. You’d have to be Walter White to be able to afford to watch all of Breaking Bad over your wireless network. It’s difficult to compare data plans to each other. Even among similar types (cable to cable or mobile to mobile), every plan has different parameters. Wired home broadband companies — cable, DSL, and fiber — tend to apply a single data cap across all of their consumers, but charge more based on how high a subscriber’s connection speed is. Wireless broadband companies — mobile and satellite — tend to give all consumers access to the same connection speed, but charge more based on how much data a subscriber uses in a month. The fact that each carrier applies their own bundles, discounts, packages, and language to their plans makes it even harder to draw an apples-to-apples comparison among plans. So, we thought, how can we take all of these different pricing systems and use one metric to draw an even comparison for the cost of data usage? Since Netflix is the driver of so much internet traffic, and streaming video is at the center of so many of the conversations around home broadband, TV seemed to be the way to go. The question we decided to answer is: How much will you pay for the data it takes to watch the entire series run of Breaking Bad in one month? There are 62 episodes of Breaking Bad. Each episode is about 45 minutes long, so the series runs 46.5 hours total. According to Netflix, each hour of HD streaming TV uses about 3 GB of data. Therfore, the entire series run of Breaking Bad uses about 139.5 GB of data from start to finish. Prices for home internet services can vary around the country, so we picked one city to use for price comparison purposes. That city is Tallahassee, FL, which has cable (Comcast), DSL (CenturyLink), and satellite (ViaSat Exede) internet services available to its residents, as well as coverage from all four of the big mobile carriers. Since Netflix recommends a 5 Mbps connection in order to stream HD content, we didn’t count plans with maximum advertised speeds of less than 5 Mbps. We also left out T-Mobile’s lowest-priced mobile plans, as users on those plans who hit their caps are throttled down to network speeds that don’t support streaming video (instead of being charged overage fees). Tallahassee is not currently one of Comcast’s test market cities for their “data threshold” trials, but since the company plans to take data caps nationwide we applied their current 300 GB limit to our calculations. However, even taking Comcast’s and CenturyLink’s data caps into account, all 140 GB of AMC’s meth-centered family drama fit under the limit for all cable and DSL plans we looked at. For mobile and satellite plans, we calculated how much extra data over the base limit Breaking Bad would use, multiplied out all of the overage fees, and then added those charges to the regular monthly fee. Using traditional home, wired broadband — cable or DSL — to watch all of Breaking Bad in one billing cycle would cost the average user between $30 and $100. Using most wireless broadband — satellite or mobile — to watch all of Breaking Bad in one billing cycle would cost the average user between $1200 and $2200. 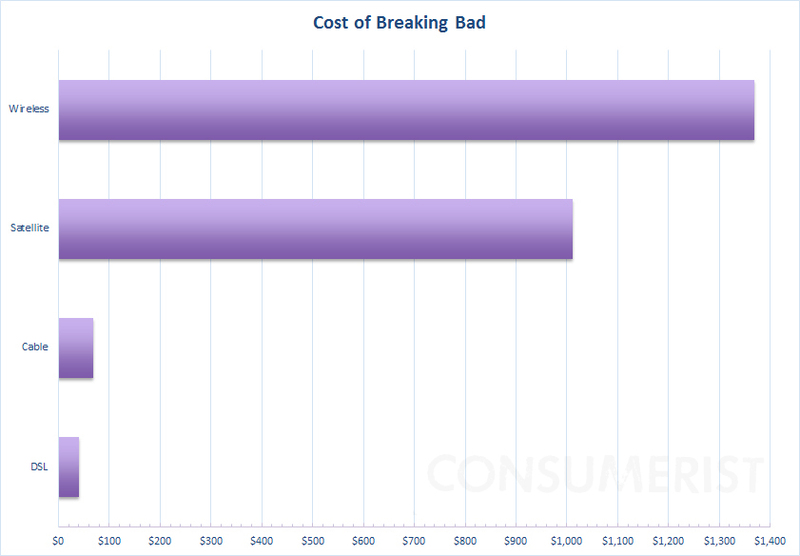 Cost of watching Breaking Bad across all data plan types. Click to enlarge. Using this much data on most mobile plans is theoretical and may or may not even be possible. Sprint, Verizon, T-Mobile, and AT&T all in some way use targeted data throttling on their highest-use customers, but none of the four clearly disclose to consumers when they’re likely to get hit. That makes it hard to get an exact calculation. Sprint and T-Mobile both have “unlimited” data plans represented at the under-$100 end of the graph but those are also both subject to data throttling for consumers whose use is determined to be excessive. That particular plan is indeed nearly competitive with cable and DSL pricing, though not with cable speeds. (ViaSat says their connection speed is about 12 Mbps, which is slightly faster than DSL and about in line with most 4G mobile plans.) The traditional satellite internet plans, however, still have very low usage limits and work out more like mobile plans. We also averaged out the cable, DSL, mobile, and satellite plans to get a more general look at how they stack up. Cost of watching Breaking Bad, averaged by technology type. Click to enlarge. The wireless average of $1369 is just under 2000% higher than the cable average of $69. Breaking Bad may just be a stand-in, but watching 50 hours of streaming programming in a month is really not an unusual activity for most modern households. The average American watches an approximate 84 hours per month of television, according to the Bureau of Labor Statistics, and each year more and more content is streaming instead of broadcast over the air or through traditional cable or satellite arrangements. And that’s to say nothing of the millions of other uses for internet connections, from homework to telecommuting to socializing to video games to making cat macros. For most of us without reliable fiber in our neighborhoods, there’s no tech out there that’s a real competition for cable. And unfortunately, for most of us, there’s also no competition among cable providers. The landscape is slowly changing, to be sure, and someday in the future we will probably marvel that we ever ran coaxial cable to our houses at all. But that day has emphatically not dawned yet.